6.50 points at 6 votes (rank 514). 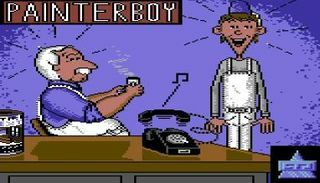 Painterboy is a promotional game of finnish company Tikkurila which is a well known paint and varnish brand in nordic countries and game is one of the first advergames ever. Game based upon 80's finnish TV and radio commercial "Dad and Son". Goal of the game is complete a different painting job for customers. Game has three main phases. First is select a correct Tikkurila's paint, second is drive to a correct destination and third is paint a building and drive back to starting location to get another task. Selecting a correct paint for next painting target is a key for success. After selecting paint is a so-called driving mode where you navigate with compass to correct location, avoiding to getting run over by a train, hit buildings or driving off the road. Target building shows up in the game map, highlighted with Tikkurila's logo. After driving phase when you arrive to destination it's time for paint various section in the current destination building. The player must avoid painting any undesired things, such as dogs, birds, the dad, and the Girl Next Door. Completing a painting task or accidentally painting any undesired objects it's time to navigate back to starting point to receive another task. Music and some slight effects are simple but quite apposite. There is also small finnish word sample: "Poika"! which is in english: "Son"! or "Hey Boy"! fmatic: "Painterboy is a funny and entertaining game. Hard enough and driving to next destination is quite complicate but not impossible". This page was last modified on 30 June 2018, at 23:52.